I first come in contact with Peter in the 60’s — I was a rocker — didn’t have much to do with country – but after hearing that banjo and voice – I stood a convert. I was always proud to say that I played with Pete for many decades at gigs and parties – and in Homestead with the very lovely Jazza Smith. Peter was the most natural all round musician I have ever worked with. The Hayes Brothers lived with their mother “Gabby” at Lady Northcote Farm school near Bacchus Marsh Victoria in the 1940’s- 1950’s where she was a Cottage Mother. So good that the CD of early music is available. 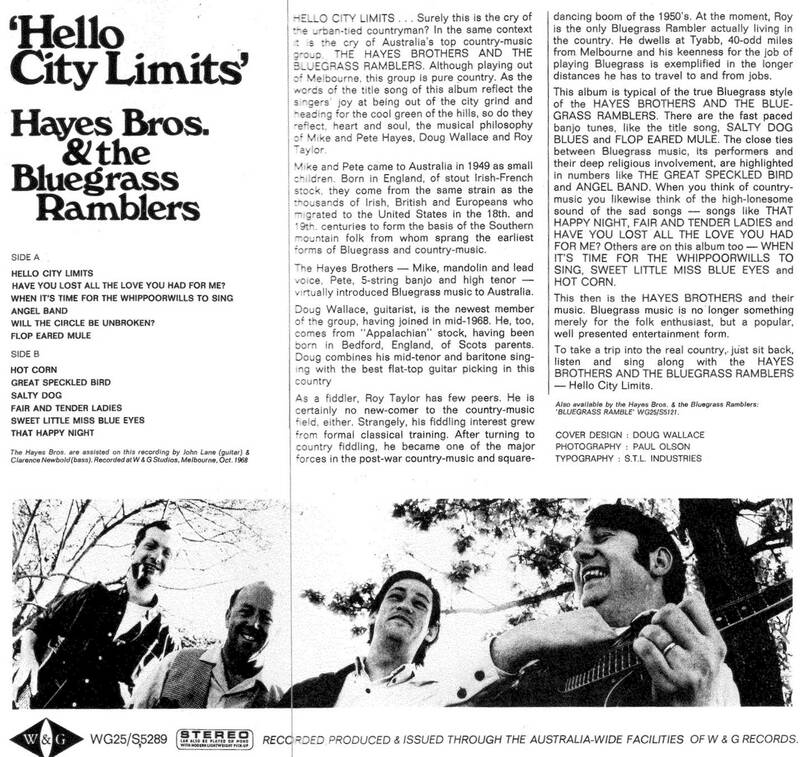 First heard the boys at the first Port Melbourne Folk Festival – about 48 or 49 years ago, and that was my introduction to bluegrass – loved it ever since. Thanks fella’s! 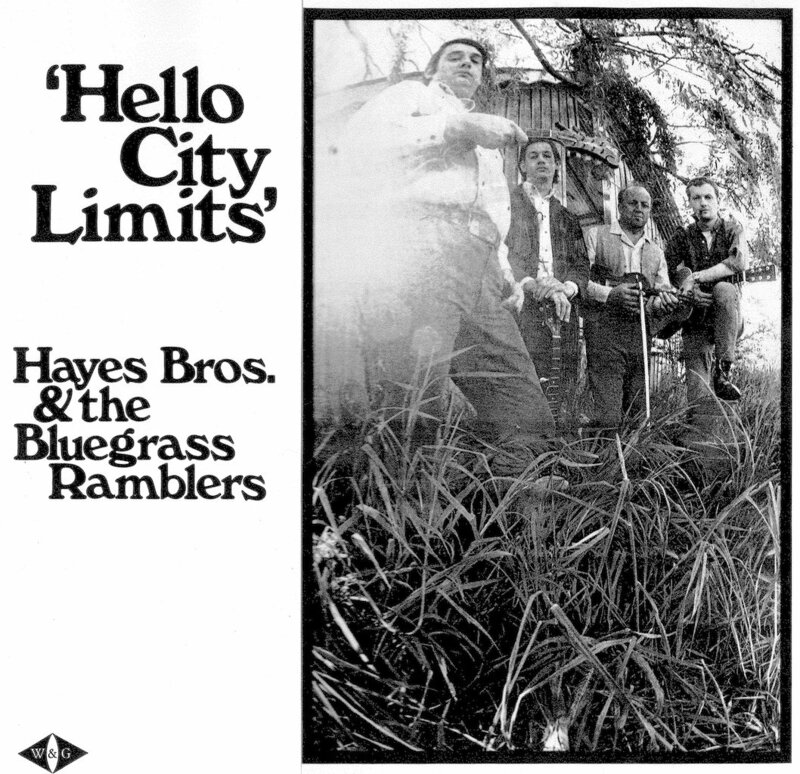 The Hayes Brothers double CD collection is now available as a re-release. Where to start with this wonderful pair. In the 70’s,Mike came down to Canberra from ABC Darwin and would appear from time to time at folk clubs and concerts. A skilful musician, and a great songwriter, I particularly remember him at that time for his song Brindabella Morning. A wistful song comparing my favourite bit of the ACT region to the Northern Territory. Later, he and wife Janet ran a couple of Prickle Farms, the first at Gundaroo just outside Canberra and the second (I think) at Laggon. NSW. There, Mike created a wonderful series of comedic broadcasts, at least one book and two TV programmes based on the trials of raising a young family on a bush block. My favourite tale was of the morning old Matt was found naked wandering down the main street of Gundaroo. The Queanbeyan constabulary rushed out and arrested him and he duly appeared in court where he pleaded guilty as charged. The magistrate asked if there were any extenuating circumstances whereupon Matt proceeded to reel of a list of problems he in dealing with his many offspring. At about child number 7, the magistrate stopped him and asked how many children he had. “18 your honour”, was Matt’s reply. Back to Mike Hayes the musician — I was fortunate enough to have recorded most of my albums in an era when real sounds from real musos were the only way so, when I wanted to add some Bluegrass and Country sounds to my kids’ albums Mike was an obvious choice. He added instrumentals, brilliant high harmonies and yup, a fabulous splash of humour. Sadly all good things come too an end and when my playing partner/wife and I split up I turned again to Mike and asked him if he was able to fill in on a 10 week tour of Victorian schools. He declined but suggested his brother Pete. So it was that I headed off on a tour with a musician I’d never met before — no script and no chord charts but oh what a musician!. I only had to concentrate on entertaining the kids. With no idea what I was going to sing next, in what key or time signature Pete provided the sort of rock solid accompaniment that normally takes hours of rehearsal to achieve. The absolute gobsmacking moment was when I realised he was weaving an intricate harmony around my ocarina playing. He was playing a standard tuned guitar with no capo and I was playing in F#!! 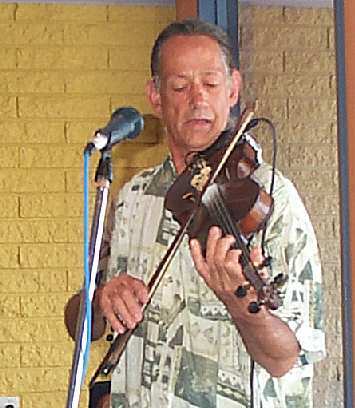 Peter was equally at home on fiddle and banjo too. My favourite memory of that tour though was the day a principal of a school went up to Pete and said in a hushed tone, “You’re Pete Hayes of the Hayes Brothers aren’t you?” Pete nodded and the teacher went into a five rave on how good they were then rsced home to get his well-worn copy of a Hayes Bros record for Peter to sign. I have heard many such stories of the Hayes Brothers over the years. This is why it was important to create this web site. It not only attempts to preserve the history, but provide opportunity to acknowledge those you were at the cutting edge in those early days of Bluegrass Music in Australia. Thanks for the additional information and sharing the memory. Ann and I remember your many adventures to Mount Isa in the 70’s and 80’s. We were active members of the Mount Isa Folk Club in those days. Thank you Mike for your lovely words about Peter. A well as being extremely talented he was always humble and very surprised when praise was bestowed upon him. I don’t think there is anyone who knew him and played with him who still doesn’t miss him as he left such a lasting impression. shop in Laggon on the side of a steep hill, we were there for 3 days from memory, Janet (michael’s wife) was spinning wool from the farm and making jumpers for sale and Mike was working in Sydney as an ABC Correspondant and travelling to and fro so we were invited to visit on a long weekend and i was young and didnt see mike much, dad and peter were close but nonetheless they were both ‘uncles’ equally loved and as such uncle mikes reputation preceeded him and lazing around one sunday arvo i picked up his dobro and asked him “can you teach me to play uncle mike?” his answer was to resonate with me for the rest of my life it was “take it and go away and play, when you feel it come back and we will start”!!. Times with pete and indeed very early memories of paula’s kind presence are numerous, too many to recount but i gained a well rounded experience in music and indeed life through them and thanks is not eonugh to say, my eternal devotion is. I had no idea Mike was a muso, let alone that he had a brother. I’ll definitely follow that up. As for Mike, I lived for the ‘Prickle Farm’ broadcasts. They aired when I was living next door to the pub in the small town or Peeramon in Queensland. Apart from the pub we were the only house in town. Loved the humour he put into the everyday trials we also lived. Ironically many years later my sister and her family were doing the same on their acres at Laggon. Then somewhat later my daughter at the small town of Gwabegar. I would so love to ge my hands on those stories to listen to again & share with my daughter in Tregeagle. Prickle farming of course.